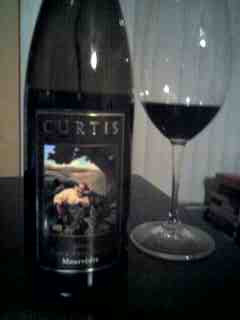 I've always enjoyed the product of Curtis Winery. Tonight I had to work rather than attend the Mardi Gras festivities in Hillcrest so I selected a bottle of their 2005 Mourvedre. Mourvedre is best known as a blending grape of the Southern Rhone valley and even this offering is a Mourvedre/Syrah blend (85%/15%). The wine is a beautiful deep cherry red in the glass and leaves lovely legs when you swirl. The nose is pleasant, a combination of violets, blackberries, hints of cherry and smoky oak and just a tiny touch of gaminess that one often gets from French Rhones. The mouthfeel is nice, good acidity and solid but not harsh tannins combine with the fruit to make for an enjoyable medium length finish. Sadly, no one to toss beads at me... oh well, there's always next year. This year I will just enjoy the wine. Oh my gosh, this wine sounds tasty. Share this wine with me, and I'll happily bring adorn you with beads. Instead of tasty wine, we are celebrating 'Pancake Day' our traditional style.